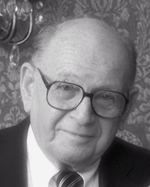 Jules R. Setnor ’32 M.D.’35, a generous benefactor of Syracuse University’s Rose, Jules R. and Stanford S. Setnor School of Music and Rose and Jules R. Setnor Auditorium, died Friday, Dec. 21, at his home in Longmeadow, Mass., at age 101. Born in Belleville, N.J., on March 21, 1911, Setnor graduated from Syracuse University’s College of Arts and Sciences and then-College of Medicine, now the State University of New York Upstate Medical University. He was a practicing physician in Springfield, Mass., for more than 50 years. Setnor met his wife, Rose ’33, who predeceased him in 2005, at a dance on their first night at SU, and the couple remained together thereafter. Married for 72 years, they shared a lifelong, mutual love of music. In 1997, they donated $3.2 million to the University to name the College of Visual and Performing Arts’ (VPA) School of Music and historic auditorium in Crouse College. The school was also named for Rose’s late brother Stanford ’42, who earned a medical degree from SU. The Setnors’ gift, which is the largest in the history of the 146-year-old music school, also supports merit-based scholarships for undergraduate music students. In 1997, the Setnors expressed hope that the gift would give young people an opportunity so that others could enjoy the benefits: “Fulfill someone’s dreams, and the whole world will gain,” they said. In 2005, the Setnors gave a $3 million naming gift to SUNY Upstate to build the Rose and Jules R. Setnor, M.D. ‘35 and Stanford S. Setnor, M.D. ‘42 Academic Building. Officially opened in 2007, the building provides state-of-the-art educational facilities for medical, graduate, health professions and nursing students. Dr. Setnor received an honorary doctor of science degree from SUNY Upstate in 2008. In 2009, Setnor was among the inaugural recipients of SU’s Orange Circle Award, which recognizes altruistic members of the University community who have done extraordinary things in the service of others.